I don't suppose the idea of writing a book called The Montgomery Life or My Obsession With Anne would roll off the tongue and be instantly appealing as the sound of The Wilder Life . (I don't know. Maybe it would be? I wonder if I could be paid to retrace all of Montgomery's steps?) Author Wendy McClure really hit on an interesting idea for a book. The subtitle is called My Adventures in the Lost World of Little House on the Prairie which makes it sound sort of like a reality-based television show on paper. That is, in fact, what I assumed it was. I assumed (correctly, I might add) that it was a story about a woman who really, really, really liked Laura Ingalls Wilder and wanted to dive into her world. I should note that I was mostly correct in my guess as to what the book was about. Really, this is a "reality show" in book form. It is a story of McClure's search to know a character that she closely identified with as she was growing up. She isn't writing the book to give us a history of Laura, times past or give us detailed instructions on how you go about twisting hay appropriately in order to keep your house heated during a long winter. It is just a meandering through her experiences and impressions as she visited various Little House locations and how her thoughts about Laura evolved over her explorations. In one sense it is an informative read because it comes across very much as a travel memoir. I could see the prairie as she described it. I could hear the rain pounding on the car roof as she drove through Kansas. (Wait. I live in Oregon. That might have been the rain on my own metal roof I heard. In my own little log cabin that I live in.) While I did learn more of the history of the Little House books, the facts were not incredibly detailed but McClure did not mean for them to be. Once again, she is merely sharing her journey into her own "Laura World" and finding that reality didn't always match up to her imaginations. Truthfully, I'm not over-the-top crazy about The Little House Books. I mean, I like them and all. I enjoy them and I was very glad to recently re-read Little House in the Big Woods (linked to our experience) to my oldest son. That was a blast! I also look forward to re-reading the rest of the series with my children in time. But Laura Ingalls Wilder is not my Lucy Maud Montgomery. So I don't feel an incredible attachment and therefore I didn't feel incredibly disillusioned by the facts which McClure does relate about the books and the Ingalls family within the pages of her own book. Mostly I was interested in The Wilder Life because I like the idea of someone loving a book or a series so much that they explore actual physical locations and learn about different customs and history surrounding their loved book of choice. I think that's just plain awesome and that is what drew me to McClure's book in the first place. 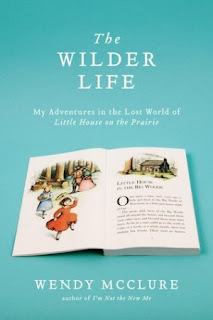 As I had mentioned in the recent past, I had received a copy of this book for Christmas and had planned to read it during Barbara's Laura Ingalls Wilder Reading Challenge in February. Then came the house "fire" and I lost my copy to smoke damage. I intended to replace it eventually when I was asked if I would be interested in reviewing the newly released paperback edition of this book. Marvelous timing! It arrived on Monday and I devoured it instantly. Yes, I did devour it even though I can't say it is going on a top favorite list. I'm still grateful to Riverhead Books for shooting a copy of this one my way! For additional options on this book, check out Barbara at Stray Thoughts said HERE. You might also be interested to know what Amy at Hope is the Word had to share. Jennifer reviewed it over at 5 Minutes for Books and gave it 5 stars. While I can't give it that, I do agree with Jennifer that the book is kind of funny. Barbara and Amy weren't as impressed with McClure's sense of humor (or "snarkiness") but I confess that I rather got a chuckle out of it. That might also be one of the reasons I read it 'till the end. Whatever her belief systems, I did think she was funny. Hey! Thanks for the link! :-) Yeah, you and I felt similarly. Thanks for the link here as well. I was looking forward to your thoughts on this. I thought it was odd to spend so much time in the book on her relationship and politics/morals as well -- I don't know why I didn't mention that, especially the latter, in my review, except to say that she wrote from "a secular, non-conservative, 'postmodern' viewpoint. It was interesting looking at LIW's life through those eyes, since most of the people I know who really like her are conservative Christians. I was surprised that Wendy found so much common ground with Laura -- I think she was surprised to find as an adult that maybe it wasn't as much as she had thought. I did think she was funny in places -- I didn't think all the humor was snarky, but some was. I thought her boyfriend was a good sport to get involved in all of this with her. I did read on her web site a while back that they got married. Like Barbara -- I am surprised that I didn't mention some of the content -- specifically the language (which I don't remember to be pervasive, but I was surprised). I think that I was just so caught up with how much I liked it. I did like her sense of humor and felt such a kinship with her childhood memories of LIW. Good to hear another opinion. I have the audio version, but have about 15 hours of Little Women remaining before I can listen to it...and with the warning of foul language, I'm not sure when that will happen. I decided I want to "read" it, but not to invest a week doing so...since it is more about the process and less about LIW. @Barbara - Yes, the back of my book jacket indicates they did get married. I should have said that in the review. Thanks for pointing that out! And I also want to point out that I thought Chris was a remarkably good sport and incredibly supportive of Wendy in her search for Laura World. I'm one of those odd persons who doesn't mind watching reality TV shows just to see how other people (supposedly) live. This sounds pretty interesting to me, but I'm tiring of books with foul language (even the ones that have good stories), as I've gotten quite enough of that in school this semester. I've only read the first few books in the Little House series, and that was several years ago. My family used to watch the TV series all the time, and, though I liked the shows when I was young, I can barely stand to watch them now (something about the acting, the drama, the one hundredth hour of hearing Mrs. Olsen whine). It's funny how your opinions of things change as you get older. So disappointing about her use of foul language throughout. Why do authors feel the need for that?? I was looking forward to reading this someday, but now may just pass over it altogether! Loved the Wilder books, but not quite that obsessed. So, I would have found this interesting aside from the foul language and political talk (who needs that?). This sounds like exactly the sort of book I'd like to read. I enjoy travel memoirs and like the author I grew up identifying with Laura. I have very fond memories of my mom reading the whole series out loud to us and making my sister and I bonnets and prairie dresses. I am actually now very excited to download (Don't un-friend me!) this book!